If you're looking for the Sparkle N Sprinkle Blog Hop...just scroll down to the next post! Hurry, though...today's the last day to comment. 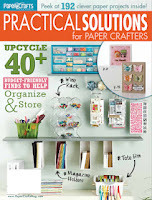 Have you seen the newest release from PaperCrafts Magazine? 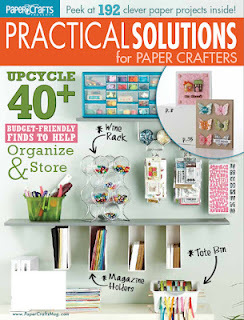 It's called "Practical Solutions for Paper Crafters" and I'm so on it! I'm a hoarder from waaaaay back. I can't stand to throw anything away that I think I might be able to use someday. Is this cover not beautious as well? I just couldn't bear to throw it away...I mean it had adhesive on it and everything. I also had a scrap of crocheted lace and a piece of butcher's cord...butcher's cord, you ask? Yep, that stuff you tie the turkey's legs together with at Thanksgiving time. I pulled them together with some scraps of Graphic 45 paper, a bit forlorn paper butterfly that got punched a long time ago and here's the result. I think I like it...gosh...I'm gonna miss seeing that ribbon scrap though!